I bought another book! I read the introduction in the preview section and I wanted to read more. 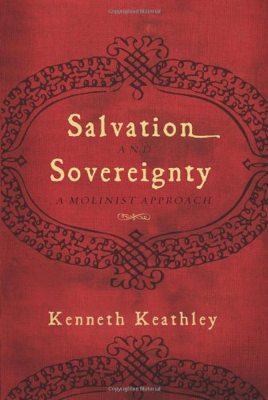 Kenneth Keathley grew up within the Reformed tradition but found himself struggling with Calvinism. He sought to bring it all into both being consistent and biblical through Molinism. But before I do read it though, I need to get the basics in place. My good friend Noel told me that Molinism is an effective alternative to a Calvinistic understanding of divine foreknowledge. But I need to know the difference between Arminianism, which is what I hold, and Molinism or middle knowledge. I found this article by Roger Olson which was helpful: Are Arminian Theology and Middle Knowledge Compatible? Olson did not give an affirmative yes to this. He said middle knowledge is "knowledge whereby God knows not only what will happen but would happen...once one believes that God uses middle knowledge to render certain that every creature does what they do by creating them and placing them in circumstances where he knows they will “freely” do something, then determinism is at the door if not in the living room and that is inconsistent with Arminianism’s basic impulses. It makes God the author of sin and evil even if only inadvertently. "Predestination is a biblical concept that classical Arminians accept, though they interpret it differently than Calvinists. Predestination is God's sovereign decree to elect believers in Jesus Christ, and it includes God's foreknowledge of those believers' faith." "God foreknows every person's ultimate and final decision regarding Jesus Christ, and on that basis God predestines people to salvation or damnation." "The first and most important point is that (Arminius) conceived predestination as primarily the predestination of Jesus Christ to be Savior of sinners." "God chose Christ as the Redeemer for that group of people who repent and believe, and chose all who repent and believe in Christ as the elect." "God sees from all eternity who will and will not accept his atoning work. God does not coerce the acceptance of his offer. The Atonement is available for all, but not received by all." "Arminians claim they are justified in embracing both exhaustive and infallible divine foreknowledge and libertarian free will because both are necessary for a sound biblical worldview. And, not all philosophers believe they are necessarily logically incompatible." I need to read much more on this to have better understanding or shall I resign to the fact that I will only know when I come to the new heaven and new earth? Always love reading about your thoughts on this subject Pearlie. Caused me to remember something I posted about a while back that dealt with this question: Is Believing in God a Part of Human Nature? Thanks for your encouragement - I haven't actually posted anything this "serious" in ages!! LOL Thanks for the link - I have put my comment there.